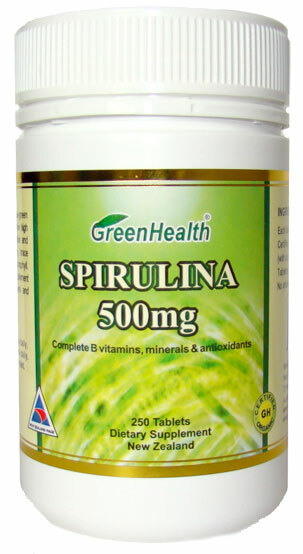 Spirulina is a plant plankton that provides comprehensive high quality nutrition. Spirulina is high in protein and contains the complete B vitamins, trace minerals, amino acids and antioxidants. Ideal for sports people, dieters and vegetarians. Adults - Take 5-10 tablets twice daily with meals or as professionally advised. Each tablets contains: Spirulina Powder 500mg (with a protein level of over 68%), Tabletting aids. No artificial flavorings, preservatives, sugar, salt, starch, corn, yeast added. No artificial colourings within capsules, except capsules shell. Spirulina is a type of blue-green algae found in most lakes and ponds. It has been consumed for thousands of years by Mexican (Aztecs, Mayans), African, and Asian peoples. Spirulina is considered a complete protein because well over half of it consists of amino acids -- the building blocks of protein. It is also a rich source of other nutrients including B complex vitamins, beta-carotene, vitamin E, carotenoids, manganese, zinc, copper, iron, selenium, and gamma linolenic acid (an essential fatty acid). In fact, at least one laboratory study has demonstrated that the iron level in spirulina is equivalent to that contained in beef. Because of its apparent ability to stimulate the immune system, spirulina may have antiviral and anticancer effects. Test tube and animal studies suggest that spirulina may also help protect against harmful allergic reactions. More research is needed to fully understand how spirulina truly benefits people. Interestingly, spirulina has been used in Russia to treat the victims, especially children, of the nuclear disaster at Chernobyl. In these children, whose bone marrow had been damaged from radiation exposure, spirulina seemed to boost the immune system.